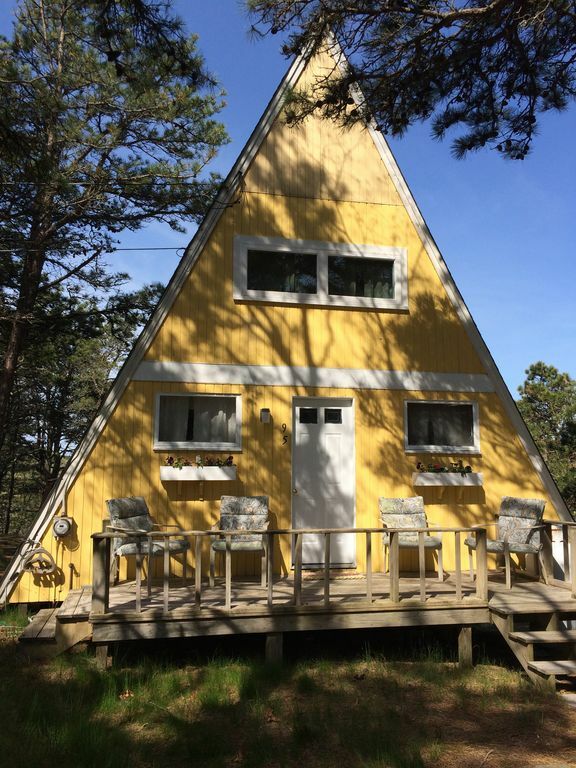 Beautiful A-frame, Beautiful views – Next to Cape Cod National Seashore, watch the sun set from the privacy of your back deck! The house is 5 minutes from historic sites, scenic vistas and miles of ocean, bay and freshwater pond beaches in the National Seashore. Three bedroom A-frame sleeps six, sits high on a hill overlooking a salt marsh and a river that winds down to Wellfleet Harbor and Cape Cod Bay. The house has an outdoor shower with a view, an intimate front deck, a spacious back deck with view for entertaining and a remodeled kitchen with espresso/coffee maker, toaster, blender and microwave. A Weber gas grill adds to the comfort of the back deck. A perfect spot for dinner at sunset! The living room has a 42' flat screen TV a full stereo VCR CD/DVD system, including complete cable (HBO, Cinemax, Showtime and NESN) as well as high speed Internet and WiFi. The outdoor shower has its own view of the salt marsh and Cape Cod Bay beaches are minutes from the house. Ocean beaches are ten minutes away. Additional Transportation: 12 miles from Provincetown Municipal Airport and the Provincetown Ferry. Boston Commuter Line from Kingston, MA is 60 miles away off Route 3. Hyannis airport is 40 miles away. Harwichport's NEW Freedom Cruise line to Nantucket is only 25 miles away. The Cape Cod Regional Transit Authority has a bus stop in Wellfleet Center. Bathroom has bathtub. Enclosed outdoor shower with changing area and hot and cold running water. Shower is private but has view of marsh. Private outdoor shower room with hot and cold water. My husband, 15 year old son, and I spent a wonderful week here and LOVED it! What a sweet little cottage! Every morning the view of the Herring River was a glorious sight to see, and I did yoga in the living room while my husband meditated on the back deck to th beauty of that view. Every evening at sunset, we enjoyed the deck out back until the sun went down. The outdoor shower was warm in the cooler afternoons. This is a very secluded spot, and we felt lucky to be here. There are games and toys for little kids in one of the bedrooms downstairs, and if we had had a rainy day, I could have easily kept small ones entertained with all that was there. The kitchen is more than adequate with anything you'll need including a large pot for lobsters. The upstairs loft bedroom is romantic with awesome views! While this is a fairly small space, we never felt crowded here. The ceiling is very high, and there is a great feeling of spaciousness. It was clean and pleasant, and we would stay here again. And there are hammocks in the woods by the side of the house - it was so perfect and peaceful! Thanks so much for your stay at the Aframe. I'm so glad you and your family enjoyed it. Hope to have you return next year! This house is hotter than hell, no closets..inadequate for more than one person. The deck is nice. No indoor shower..the outdoor one is gross. I was very disappointed to hear of your dissatisfaction with your stay. The house sits on a lovely hill overlooking a salt meadow that empties into Cape Cod Bay. With the windows and screen doors open, the breezes quickly restore and maintain a pleasant and moderate temperature. The unique shape of the Aframe makes conventional storage a challenge. We provide bedside drawers, bookshelves, under the bed storage and racks behind the door to allow for additional storage. When you spoke of your concern about your footing in the shower, we promptly sent over someone to power wash the shower to address that need. At your request, we purchased and installed a deck umbrella for your convenience. Finally, the house has 3 bedrooms, 2 decks (one 25 by 13 feet), a front room with a two story cathedral ceiling and sits on almost an acre of secluded land next to a National Park. It seems that there is more than adequate space for more than one person. Pro: Large deck with gorgeous view. Really enjoyed having my coffee when the sun came up. House is nice enough with all amenities but when we arrived it had not been cleaned at all. Cons: The kitchen and bath floors were dirty -- the stove had gunk all over the edges, the toaster was just used and full of crumbs. Worst is that the sun streams through a 2nd floor picture window that is unreachable (or I'd cover it with black out curtains). It heats the house up to 100 degrees during the day and there is no A/C. I don't appreciate your writing your negative review, the first I've had in over ten years of renting the Aframe. I feel that we reached out to you and made every accommodation we could. I am disappointed that it wasn't enough for you and that you decided to go this route. Stayed for a week with two teenagers. The pictures do not show the living area which is actually large enough for two couches (one of them a futon) and a low table. The two first-floor bedrooms are small, but would be fine especially for smaller guests. The loft bedroom is spacious and looks out over the living area.The kitchen is small but functional. The back deck is as gorgeous as pictured. It overlooks the herring river and protected land beyond. A great place to have friends or relatives over for dinner/cocktails. There is supreme privacy - you can barely see the neighbor houses through the woods, and hear only the birds. The AFrame gets warm on warm summer days, and on those days we stayed outside for the most part. I was concerned that we would be uncomfortable sleeping, but it cooled down sufficiently at night and there are several fans. Small bathroom with tub, outdoor shower. This property fit our needs and wants very well and I am looking forward to returning. Thinking about a FALL vacation? There are sunny, uncrowded beaches with warm waters, art galleries and fall festivals waiting for you! We have the perfect location on Wellfleet in a secluded woodland next to the Cape Cod National Seashore. You can taste all the pleasures of the outer Cape in the summer, sunny beaches,bike trails, National seashore nightlife in Wellfleet and Provincetown, yet go back to your private cottage in the woods..